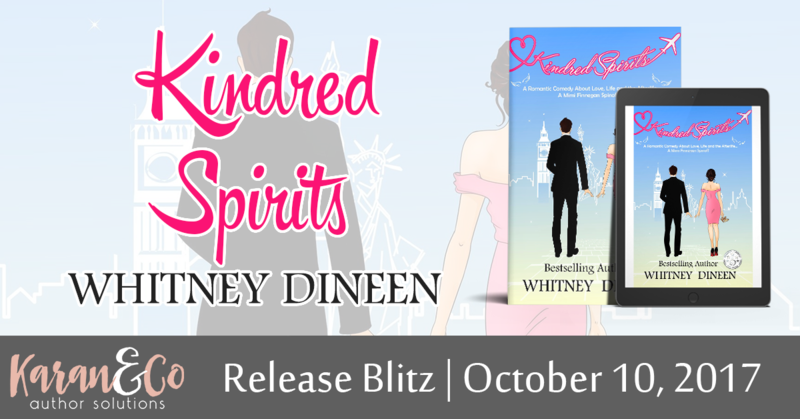 Happy Release Day to Whitney Dineen!! Her newest Romantic Comedy, KINDRED SPIRITS, is available now! I am reading this book right now! And I’m loving it. Next week, I am delighted to be hosting a stop on Whitney’s blog tour- look for more book info, my review and an amazing giveaway! Dashing and successful, Richard Bingham has been voted one of the top ten bachelors in New York City. After unwittingly offending a reporter from Manhattan Life magazine, he finds himself on the receiving end of an article that makes his quest of finding the perfect mate nearly impossible. After one dating disaster too many, Richard decides it’s time to seek professional help, so he signs up for the matchmaking services of the East Side Yenta. Philippa Fielding is single and searching for love in London, but her accidental profession of “Message Deliverer from the Great Beyond” puts most men right off. Will Pip’s new “Spirit Helper,” Bertram, be able to set her on the course for true love with a message for Richard? Matchmaking, misunderstandings, and mayhem abound in this fast-paced romantic comedy about love, life, and the afterlife! Kindred Spirits is a stand-alone spinoff on the Award-winning Mimi Finnegan books. The Reinvention of Mimi Finnegan won a silver medal in the 2015 Readers’ Favorite Awards, was a finalist at the RONE Awards, and won Honorable Mention at the London Book Festival. Mimi Plus two was a finalist at the 2016 Readers’ Favorite Awards and Runner Up at the London Book Festival. During “The Hollywood Years,” Whitney was bitten by the writing bug and started creating characters that are inspired by strong women with a great sense of humor. Her first romantic comedy, She Sins at Midnight, won a silver medal in the 2015 Reader’s Favorite awards. Her second, The Reinvention of Mimi Finnegan, is a finalist in the 2016 RONE Awards, won a silver medal at the 2016 Reader’s Favorite Awards and won Honorable Mention at the London Book Festival. Her third chick-lit book, Mimi Plus Two, is causing all kinds of controversy and who the heck knows where it will land. Although, it was a finalist in the Reader’s Favorite Awards and a Runner-Up at the London Book Festival. In addition to her love of chick-lit, Whitney has also written a series of adventure books for middle readers. The first two books in her series, Wilhelmina and the Willamette Wig Factory and Who the Heck is Harvey Stingle?, are both available now. Book three, Beware of the Basement, is due to be released in the winter of 2017. Whitney and her husband, Jimmy, have relocated to the beautiful Pacific Northwest to raise their children, chickens, and organic vegetables.